Baltimore City was awarded funding for three projects in the 2018 Chesapeake Bay Green Streets-Green Jobs-Green Towns Grant Program. The Chesapeake Bay Trust, in partnership with the U.S. Environmental Protection Agency (EPA), Maryland Department of Natural Resources, and the City of Baltimore Office of Sustainability announce $693,791 in funding for the Chesapeake Bay “Green Streets, Green Jobs, Green Towns” Grant Program. These grants help communities develop and implement plans that reduce stormwater runoff, increase the number and amount of green spaces in urban areas, improve the health of local rivers, streams, and the Chesapeake Bay, create “green jobs,” and enhance livability in cities and communities. 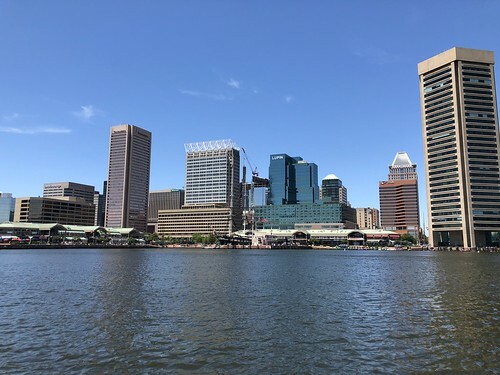 This announcement highlights awards for 21 innovative green infrastructure projects in Delaware, the District of Columbia, Maryland, Pennsylvania, Virginia and West Virginia. Recent studies show that greening communities results not just in healthier environments, but improvements in human health, reduction in crime, reduction in energy use, and improvement in economic activity in commercial districts. Baltimore City recently developed a Green Network Plan, a bold vision for reimagining vacant and abandoned properties and transforming them into community assets, creating an interconnected system of flourishing spaces through the city. Implementation: Adkins Arboretum Parking Lot Alive! To install stormwater best management practices in the Adkins Arboretum main parking lot, including replacing 1,790 square feet of impervious surface with bioretention garden and pervious paving. To restore and green a vacant lot in the Druid Heights neighborhood in Central-West Baltimore. To support the newly formed Frederick Food Security Network, which addresses the needs of both stormwater management and food insecurity through a collective of urban farming operations, including vegetated rain gardens. To increase tree canopy by planting 450 street trees and greening over 2.5 miles of streetscape in Northeast Baltimore. To support a pilot program to green vacant lots in Cambridge, MD, creating multi-use community green spaces that have environmental and human benefits. To reduce impermeable surface in the Canton neighborhood of Baltimore City by creating and expanding tree pits and maintaining new trees that are planted. To fund a conceptual plan to incorporate next generation, high performing green infrastructure into the historic downtown area of Annapolis. To develop a conceptual plan for future greening projects in the downtown area. To develop a conceptual plan for stormwater management practices in an Intensely Developed Area within the town’s designated Chesapeake Bay Critical Area. To increase the number of street trees to be planted in 2018 and 2019 by 54 percent. soon house the Laurel Police Department. To design enhanced tree boxes that will treat stormwater runoff at the iconic Dupont Circle. incorporate green infrastructure into all public-right-of-way construction projects, when feasible. For green infrastructure designs for the renovation of Culliton Park. Towns in need of similar stormwater management solutions. in the Spring Creek watershed. to complete design plans that can be implemented. To continue green street efforts on Minefee Street in the Bellemeade neighborhood of Richmond.